Vision and goal-setting for my art career was at the top of my priority list when I retired as Program Manager at Aboriginal Leadership at The Banff Centre in late December, 2010. “Okay – you did it. You made the leap. That has to be one of the biggest and most important challenges for any artist or organization. Even on a personal level, it’s quite something to really think about what you want from life, succinctly define it and take the action to get there. It’s another thing to get to the action of visioning, getting organized, planning it out and doing it. I realized that I needed some help, guidance and support in this endeavour, despite my years of experience as an artist, entrepreneur and project/program manager. It’s totally another thing when you are the head of your own organization, and I took the advice I had been giving out for years to others but was so bad at taking myself when it came down to it. Find a coach that you respect and who has more experience than you, to help you focus, move into action and achieve your vision. Find someone you can relate to. Now…where would I find such a generous coach who really understood me as an artist and what the specific challenges may be in a cultural industry in a bad economy? There are business coaches out there who are a dime a dozen, all peddling the same wares. WHO is focussed specifically on us creatives? In December, I started scouring the art book and business sections of Chapters, Indigo and Amazon to find some useful resources and read up on the literature out there with the purpose of designing my own plan of action. After all, hanging out with some hefty academics after six years, you learn to do the lit review first! Before Santa even finished his last toy and got into his big red flying vehicle, I had a pile of shiny, freshly printed new books sitting on the coffee table in my studio. Merry Christmas to ME! I began to read, looking for that one Secret that would motivate me to successful action. The “One True Ring” …and my Gandalf! 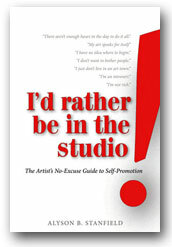 While some of the books were excellent, none of them stood high above the others and shone with the same practical advice and personal manner as “I’d Rather Be In The Studio”, by Alyson Stanfield. her advice, adored by her followers and “gets” the social media scene. You really feel that she is involved and personally driven to help you succeed as an artist. I’d found my coach!….and then the hard work began. Find out how I start the journey and set my own Big Hairy Audacious Art Goals for 2011 in an upcoming blogpost by subscribing to the Janice Tanton Blog. Thanks Alyson. I’m in your debt. Janice: Thank you for your generous words. I’m so glad that what I share resonates with you. I am grateful for your presence in my classes and in the Artist Conspiracy. It certainly does, Alyson. Keep on doing what you are doing. We are all lucky to learn!